CALIFORNIA (USA), Oct. 10—United Teachers Los Angeles voted overwhelmingly in August to authorize a strike if no contract agreement is reached. UTLA and the LAUSD Board are in mediation (mandated before a strike can legally start) but the talks are likely to stall. If UTLA leaders “play by the rules,” a strike – if there is one—would probably start between Thanksgiving and Christmas (late November to mid-December). As we saw in the school strikes in West Virginia, Arizona, and Oklahoma earlier this year, strikes in the schools often spread beyond the schools into the communities. Immediate family members, many of them industrial workers, are directly involved. This creates opportunities to bring communist ideas to the masses. 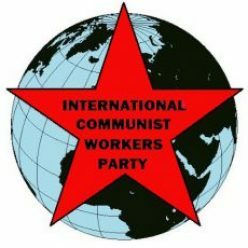 The ICWP in Los Angeles has begun to strategize and organize around the schools so that whether or not there is a teacher strike, we can build our party and spread communist ideas. Teachers’ Strike! Mobilize for Communism! Capitalism is a class dictatorship. The capitalists rule over the working masses. We are constantly confronted with the need to fight for our survival while being attacked by all forms of capitalist aggression: racist police terror, separation of families, sexist attacks on women and raging wars. This system is absolutely intolerable, the insanity of all that we see on a daily basis is unbearable. The possible United Teachers Los Angeles (UTLA) strike is an example of the fightback for better schools, better working and learning conditions, better health benefits and better pay. But under capitalism the educational system is set up to reproduce capitalist relationships of class oppression. The masses of workers, students and soldiers need to mobilize to get rid of capitalism through armed struggle and communist revolution. History has shown us that this is possible. With communism the masses of people will be in charge, without any form of money or hierarchy; nothing is bought or sold and no one is above us or below us. All of us will work together collectively in all fields, including education. Education will no longer be to replicate capitalist relations but rather to foster communist relations. We will have the best possible education that’s tied to real life and human liberation. Collectivity will assure the best possible lives that we can have. Everyone will be welcomed. Communism will free all of us from racism, sexism, homophobia, borders, or any other form of oppression. Join us in building this world by reading and writing for Red Flag, our international revolutionary communist newspaper. Help to distribute it to friends, family, coworkers, and neighbors. Form or join a Red Flag study group. 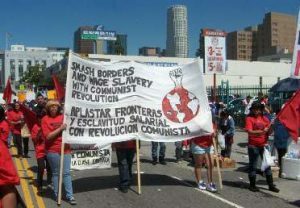 Attend rallies, protests, and demonstrations and distribute the paper and communist flyers.